Numerous studies have proven a causal link between mobile phones and distracted driving. There are very few issues that require a driver to use a phone while driving, and even emergency calls are often not true emergencies. If you must answer the phone, pull over to the side of the road or into a parking lot. When stopped in a safe place, answer the phone or call the person back. Better yet, most mobile phones and carriers now offer “driving mode” utilities or apps which prevent voice calls and texts from ringing (or announcing) on your phone and inform the caller you are driving and will respond later. This safety feature removes entirely the temptation to answer a call or respond to a text while driving. In addition, many states and localities have passed laws requiring hands-free mobile phone usage or entirely banning the use of mobile devices while operating a motor vehicle. These laws are meant to protect us, and should be followed. Nothing is more distracting than talkative or unruly passengers. Babies, toddlers, and young children may distract a driver by throwing things, screaming, yelling, or simply making noise that makes a driver to take their eyes and attention off the road. Establish early on with young children (when they are old enough to understand), and adults as well, that no one should distract the driver of a car. This is particularly important with young adults and young adolescents, including especially teenagers who are learning to drive or have friends who recently received their licenses. Also, try to avoid lengthy conversations with passengers while driving. Research has shown the “simple” act of engaging in a conversation is not simple at all, and actually diminishes our ability to timely process data, make good decisions, and quickly react to sudden emergencies and situations arising in a split second. Finally, loud music and even books on tape can be distracting. Anything that allows our minds to wander, taking them from the serious task at hand – safely operating a 1.5 or 2+ ton machine at speeds that can maim or kill – is potentially hazardous. Using one hand to eat or handle food and drinks while driving means one less hand on the steering wheel. Should you happen to drop food or spill liquid on your clothes, you’re more than likely to avert your eyes from the road and look down to check for damage. Don’t take that risk. All it takes is a moment for a driver’s eyes to be diverted and suddenly expose everyone in your vehicle (and others on the road) to a serious, possibly deadly, mistake. Eat and drink only while parked to avoid food-related distractions while driving. 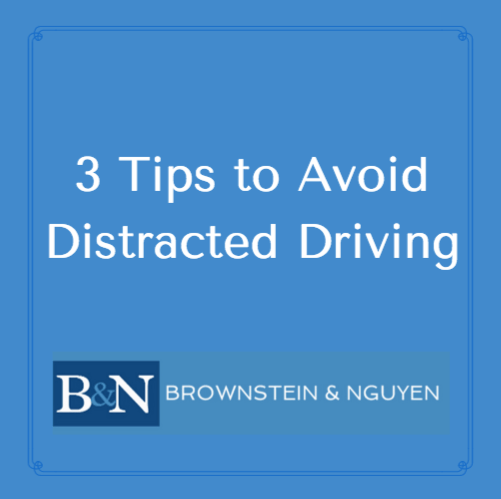 Brownstein & Nguyen has assisted numerous individuals in the aftermath of avoidable car accidents. However, don’t become a statistic (or client) in the first place. Follow the above tips, and always put safety first.